– Mysterious band with not much information to be found anywhere. They were in fact neighbors with the guys from the other Scarab, both coming from the greater Birmingham area. 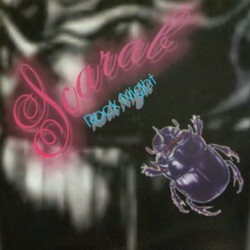 According to Paul Britton from the other Scarab, members of both bands never actually met. 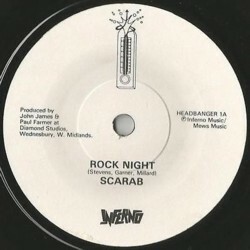 The Wednesbury Scarab (this) might have been a bit older as they started in 1979. As far as he can tell they never played a single gig. This added to the general local confusion as most fans at the day (and for several years after that) thought that there was only one Scarab. *Original pressing by Inferno Music never in picture sleeve.